Youve heard the saying, An apple a day keeps the doctor away. An apple is healthy- but I can show you what super foods will keep ten doctors away: cardiologist, neurologist, brain surgeon, cancer specialist, and so on. There are foods so powerful that they can defend every part of your body from disease. Health = Nutrition / Calories. You want as many vitamins and minerals and as few toxins in your calorie allotment as possible. How much nutrition is there in our food? Much less than our great-grandmas got in theirs! 80% of us don't get enough of vitamin B6, more than half lack iron, magnesium and calcium. Food is produced in industrialized way - quantity, not quality, defines the profit. We dont let the earth replenish itself naturally, so poor soil produces plants with fewer nutrients than they should have. To fend off pests, produce is sprayed generously with pesticides, up to 12 times in its lifetime. Nutrients get destroyed in transportation and storage. Whats left on your plate? Even natures perfect foods are almost empty. As a result, even a balanced diet food is deficient in nutrients. That's why craving and overeating has become the norm  after getting empty calories, cells still crave vitamins and minerals. Remember: Health = Nutrition / Calories. Based on this formula, sugar and most fats are the worst offenders. Lets look at the list of champions- the top healthy food list. Sprouts are the most economical and nutritious food. At the sprouting stage of growth, plants have the highest concentration of proteins, minerals, enzymes, antioxidants, anti-carcinogens, vitamins and minerals. Broccoli sprouts prevent cancer. They raise level of body's own protective enzymes that work on many kinds of precancerous cells, according to John Hopkins University scientists. Home grown organic sprouts are the best. If you grow them at home, they get to your table without losing any nutritional value. Did you know that leafy vegetables lose 50% of vitamins and minerals within two days of harvest? From 15-30 cents worth of seeds, you can grow a pound of fresh, delicious, organic sprouts or leafy greens. Click here to see what's inside 100 g of sprouts and compare it to other food such as milk and eggs. Kale, Swiss chard, dandelion, bok choy, spinach, collard greens, mustard greens. Some greens, depending on soil quality, can develop 20 or more percent completely absorbable, balanced protein. For very few calories, you also get lots of vitamins, minerals, and all sorts of enzymes. These Kale recipes and healthy greens recipes will help you start eating more greens. You may resist the idea of eating more greens because they just taste bitter. Bitterness is the demonsstration of the presence of antioxidants. Start small, and put some greens into your salads and smoothies. After eating greens for about two weeks, your taste buds readjust themselves. Many people actually start craving greens - their body, given a choice, craves super foods rather than empty food. Oregano, cilantro, parsley, thyme, peppermint, turmeric, sage, ginger. Can your soup or tea help you to boost your memory or heal your sore throat? Yes, if you add sage, a natural memory enchancer with powerful anti-inflammatory qualitites. Can your salad protect your bones and eyes? Absolutely, if you use parsley. The benefits of herbs for the human health are remarkable! Broccoli, rapini, cabbage, asparagus, carrots, cauliflower, beets, onion, garlic. 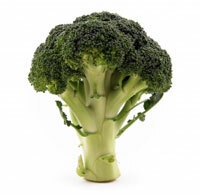 Did you know that 100 calories of broccoli have twice as much protein as beef? Cauliflower doesn't get as much attention as orange, yet one cup of it provides daily value of Vitamin C, in addition to all anti-cancer and liver-detox benefits. All this with no sugar. Garlic is most famous for its potent anti-inflammatory and antiviral benefits, but it's ability to fight coronary heart disease by unplugging arteries is also amazing. #5. Fruit is the ultimate healthy snack. Apples, plums, pears, banana, pomegranate, mango, etc. 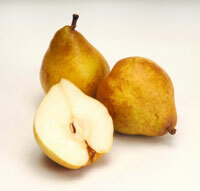 Fruit provide fructose mixed with a healthy dose of fiber, vitamins, and critically important minerals. Dried plums, also known as prunes, are one of the top two antioxidant foods. Pomegranate is a top runner up for the antioxidant crown,too. One banana a day can provide a dose of potassium, helping to reduce blood pressure and fend off cardiovascular disease. Almond (and almond milk) , Brazil nuts, cashews, walnuts, pine nuts Almonds, for example, are very high in good protein, they help against diabetes and cardiovascular disease. This small potent nut is capable of lessening after-meal surges of blood sugar, lowering cholesterol and protecting against arteriosclerosis. I add ground flaxseed to my baking, dehydrated crackers and healthy smoothies. Not only it acts as an egg replacer and increases vitamins absorbtion, but also provides enough omega-3 for a day to keep your brain going. Quinoa is an excellent protein-rich food. It consists of about 20% of complete protein; it is high in lysine and is a good source of iron, B vitamins and potassium. Cranberry provides potent antibacterial and antiviral benefits - it can fight e-coli, boost defence against herpes virus, and increase effectiveness of drugs against H.Pilori. It shows promise as a natural alternative to antibiotics. It's ability to fight bladder infections was known for centuries. 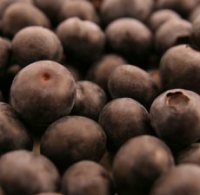 Blueberry is probably the most advertised berry. 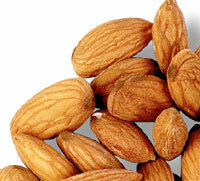 It provides an array of health benefits due to its antioxidant content. Chlorella is nature's top energy food. It provides all essential amino acids in perfect ratios, and is often used to prevent or curb the spread of cancer, enhance immunity, promote a good balance of bacteria in the gut, and lower blood cholesterol. 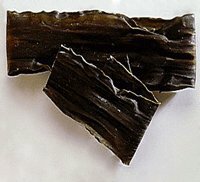 Kombu increases digestability of beans; it also acts as an antidote to excess sodium consumption and it is known to reduce blood cholesterol and hypertension. Use kombu in a miso soup. Unassuming miso soup is a powerful natural remedy to many health issues. Flax oil, Olive oil, hemp oil. It seems counterintuitive to place fats into top ten healthy foods, but you absolutely need some fat in your diet. Certain fats are vitally important for the body, both saturated and unsaturated. Omega-3 fats are essential to brain function. Saturated fats are needed to build cellular membranes throughout the whole body. Dont exclude fats from your diet, but use moderation and choose the best. Aim for fats naturally present in foods, such as flax seed and avocado. Avoid all hydrogenated or trans fats, reduce saturated fat. Add a teaspoon of flax or hemp oil to your salads or healthy smoothies. Some vitamins, for example, Vitamin A, are oil-soluble. In other words, your body will not absorb them unless they come with some form of oil. Adding flax oil or flaxseed to your smoothie will not alter the taste, but increase nutritional value of it. Wondering where your pork chops and lean chicken went? Calorie per calorie, these plant foods come up superior to all meat or dairy products. How can you start using these top 10 healthy foods? Come back regularly! I add healthy food recipes every week, and I make sure they are easy, quick and tasty. Introduce these powerful foods to your family with my tasty recipes. This week when you do your grocery shopping, use my checklist of healthy foods. Why not commit to trying one new food per week?